The first few weeks of life are extremely important to the survival and healthy upbringing of your baby betta fish. If you properly feed the baby betta fish with high-protein foods, you keep their tank properly maintained, and you follow these baby betta fish care tips I’ve outlined below, your fish should grow quickly and be completely healthy for a long time. You must maintain high water quality in the tank by using a sponge filter. Sponge filters offer mechanical filtration without creating too much water flow to put your new baby at risk. You must set the thermostat on the heater in your baby betta fish aquarium between 74 and 80 degrees. If the water temperature takes on drastic changes, it will negatively influence the health of your new babies. Refer to our post Importance of Having a Betta Fish Heater for more information on this topic. Wait for the baby to absorb all of its yolk sac. If your fish are the bubble-nesting species, the male will care for the fry until the yolk sac has been absorbed and the fish is free swimming. If your fish is of the mouth-brooding species, they will release fully formed fry after just 16 days of incubation. Be sure to feed your baby betta fish a small amount of infusoria multiple times per day once they have absorbed the yolk sac. This is a liquid fry food that can be added to the tank directly with an eyedropper. After a few days of feeding with infusoria, transition the baby betta fish into accepting brine shrimp nauplii. If you feed your fish properly, they will grow very fast and will be ready to take on larger foods after three or four days. Offer the fry finely crushed, freeze-dried or frozen foods like daphnia or bloodworms after three to four weeks. Once the baby reaches six weeks, transfer it to a ten gallon grow-out tank. A grow out tank is just a big tank where the fish has space enough to grow out, as the name implies. If you have multiple baby betta fish, you should divide them into two grow out tanks to ensure they have adequate room. Make sure you maintain high quality water by changing 25% of the tank volume twice per week. Use an aquarium vacuum to siphon out dirty water and replace it with de-chlorinated tap water which is the same temperature as the water inside of the tank. 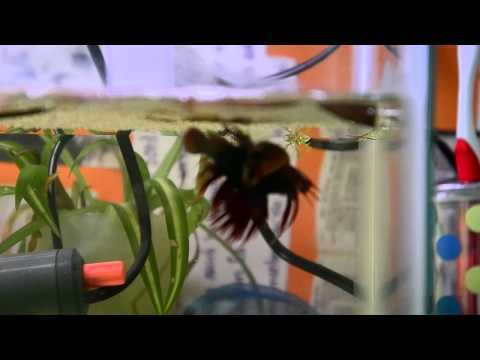 This is very important for proper baby betta fish care. Start feeding your bettas a plethora of different foods including frozen, pellet, and live foods multiple times per day until they have grown to ¾ of an inch in length. *When you pick out freeze-dried or frozen foods for the baby betta fish, make sure you buy high quality food. Many live and frozen foods can contain bacteria or parasites if they are not manufactured properly. You want to ensure the food you are giving your baby betta fish has been properly sterilized. Have you had any luck with breeding betta fish and/or baby betta fish care? If so, I’d love to get your feedback. Just use the comment box below. Until next time!